Many people eat olives because they love the taste but the nutrition in olives makes them a healthy choice too. 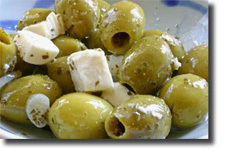 Olives are used in recipes and come in different varieties. When they begin to ripen they change color and go from a deep green color to a black color. But because of the bitterness in an olive, they have to go through a cooking and pickling process. This removes the bitter taste but depending on what spices and herbs are used it can also change the flavor dramatically. The pickling process can remove some of the nutrition in olives. Olives are rich in iron and it gives the body energy throughout the day. It helps to reduce the risks of certain cancers and it helps to strengthen the body’s immune system. It helps children develop strong minds so that they are able to learn more and without enough iron a person may become anemic. Vitamin E is also present in olives. This vitamin protects the largest organ we have, which is our skin. It is an antioxidant that helps to fight off damaging free radicals and produces not only younger looking skin but can reduce lines and wrinkling on the face and body. Vitamin E can also be used to repair sun burnt or scarred skin. It promotes good blood circulation and it is recommended that people with diabetes take a vitamin E supplement everyday. Along with all of the other nutrition in olives, they also are very high in fiber. Fiber can be found in breads, cereals, whole grains, vegetables and fruits. It is known for aiding the digestive system and helps with elimination. Fiber is very important because it pushes food through the body and consuming it everyday can help with constipation. But perhaps the most common way people gain nutrition in olives is by consuming olive oil. Olive oil is made by the pressing of olives for its juice. The juice contains all the nutritional benefits of olives and it is used everyday in cooking. This is the only type of vegetable oil that can be eaten as is and this is considered to be a healthy habit. It lowers the LDL cholesterol levels and raises the HDL good cholesterol levels. This is not only good for the heart but it can help to prevent heart disease. It also helps to prevent colon cancer. There are four types of olive oil. Each type has been pressed a certain amount of times. Extra virgin olive oil is the least processed or pressed type of oil. It is considered to be the best type of olive oil. Virgin olive oil is next in line and it is pressed twice. Pure olive oil has been pressed and also filtered, further removing its nutritional value and extra light olive oil has been processed many times and actually has little olive flavor. Because of all of its benefits olive oil is recommended for people who are trying to lose weight. But many people shy away from using it because it has a high calorie count. You do not have to consume over two tablespoons a day to receive all of the benefits and it may help curb your appetite. Olive oil is rich and when you add it to foods it can also make them richer. This makes the food more filling and satisfying. People who eat it on a regular basis have a much easier time avoiding excessive snacking because they feel fuller for a longer period of time. Whether you choose to eat a few olives or pure olive oil, you can feel good about indulging in a healthy food.